Jason Gillespie believes his Sussex Sharks need to be more adaptable if they are to replicate their outstanding away form in the Vitality Blast in front of their own supporters. 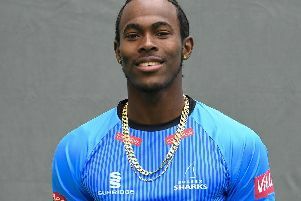 Sussex are second in the South Group after Thursday’s 12-run win over Middlesex at Lord’s which was sealed by Jofra Archer’s last-over hat-trick, the first by a Sussex player in the competition’s history. It was their fourth away victory in eight games but Sussex have yet to win at Hove. They were on the end of an Aaron Finch masterclass against Surrey a fortnight ago before coming unstuck on a slow, low surface which played into the hands of Gloucestershire’s medium-pace attack on Wednesday. It’s been a familiar theme at Hove this season where one of the quickest one-day attacks in the country has been neutered somewhat by pitches lacking pace and bounce. The likelihood is that the same pitch will be used for Sunday’s game against Somerset which means bowlers adapting and batsmen communicating better, according to Gillespie. “We didn’t adjust to the conditions when we batted and then you’re always going to up against it when you lose four wickets in the power play,” added Gillespie. “Whatever conditions we are presented with on Sunday we need to adapt and learn our lessons. Gillespie’s decision to bring in Delray Rawlins for his T20 debut the following night was vindicated when he scored 49 off 35 balls but Tom Bruce is finding it tough. The New Zealander has a top score of just 10 in six innings so far, although he retains the full support of his coach. Bruce’s fellow overseas player Rashid Khan has no such worries about form. The Afghanistan leg-spinner turned down several Caribbean Premier League franchises to extend his stay with Sussex for the rest of the Blast but the 19-year-old is thinking beyond the next few weeks and trying to get his side back at Finals Day.